Visualize a single particle, measuring just one-tenth the diameter of a bacterium, whose minute jiggles prompt continual vibrations in a mechanical device that is about 50 times larger. By exploiting the clever advantage of interplay between light, electrons on the surface of metals, and heat, scientists at the National Institute of Standards and Technology (NIST) have for the first time formed a plasmomechanical oscillator (PMO), thus named because it firmly couples plasmons—the collective oscillations of electrons at the surface of a metal nanoparticle—to the mechanical vibrations of the much bigger device it is implanted in. The whole system measuring no bigger than a red blood cell has numerous technological applications. It offers new methods to miniaturize mechanical oscillators, enhance communication systems that rely on the modulation of light, greatly amplify very weak electrical and mechanical signals, and produce intricately sensitive sensors for the minute motions of nanoparticles. The NIST scientists Brian Roxworthy and Vladimir Aksyuk described their research in the latest issue of Optica. The device comprises a gold nanoparticle, about 100 nm in diameter, embedded in a miniature cantilever- a tiny diving board - composed of silicon nitride. There is an air gap sandwiched between these components and an underlying gold plate; the width of the gap is regulated by an electrostatic actuator - a thin gold film that is positioned atop the cantilever and bends toward the plate when a voltage is applied. The nanoparticle serves as a single plasmonic structure that has a natural, or resonant, frequency that differs with the size of the gap, just as tweaking a guitar string alters the frequency at which the string reverberates. When a light source, here laser light, shines on the system, it makes the electrons in the resonator to oscillate, raising the resonator’s temperature. This readies the stage for a multifaceted interchange between light, mechanical vibrations, and heat in the PMO, endowing the system with several important properties. Roxworthy and Aksyuk changed the optical frequency at which the resonator vibrates and the intensity of the laser light the system reflects by applying a small, direct-current voltage to the electrostatic actuator that squeezes the gap shut. Such optomechanical coupling is very desirable because it can moderate and regulate the flow of light on silicon chips and shape the propagation of light beams moving in free space. A second property relates to the heat produced by the resonator when it absorbs laser light. The heat makes the thin gold film actuator to expand. The expansion tightens the gap, reducing the frequency at which the embedded resonator vibrates. Conversely, when the temperature drops, the actuator contracts, expanding the gap and increasing the frequency of the resonator. Significantly, the force applied by the actuator always kicks the cantilever in the same direction in which the cantilever is already moving. If the incident laser light is sufficiently strong, these kicks cause the cantilever to experience self-sustaining oscillations with amplitudes thousands of times greater than the oscillations of the device because of the vibration of its own atoms at room temperature. 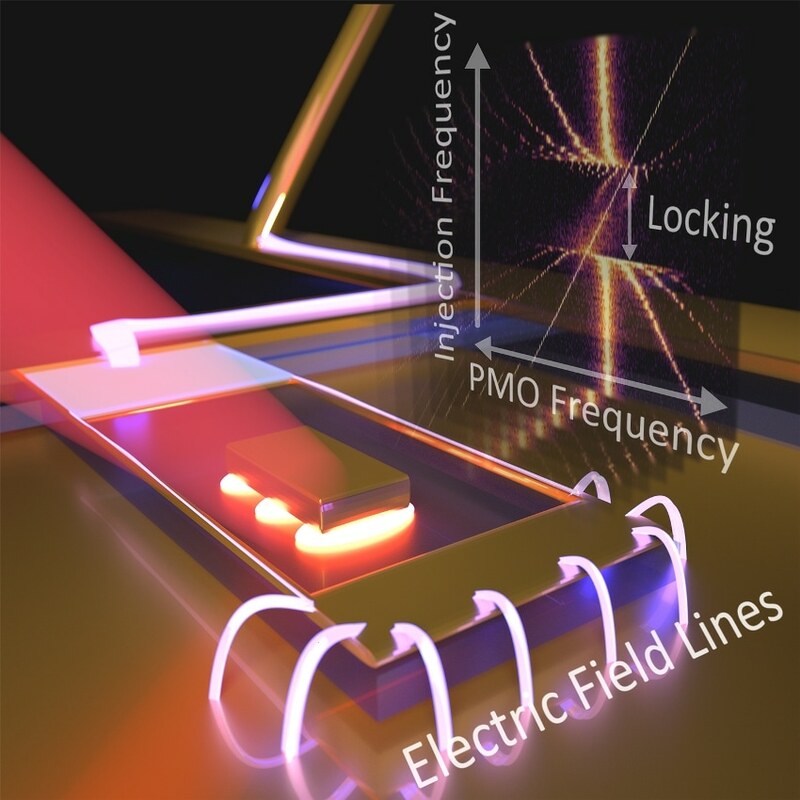 “This is the first time that a single plasmonic resonator with dimensions smaller than visible light has been shown to produce such self-sustaining oscillations of a mechanical device,” said Roxworthy. The team also showed for the first time that if the electrostatic actuator provides a small mechanical force to the PMO that differs in time while the system endures these self-sustaining oscillations, the PMO can lock onto that minute variable signal and importantly amplify it. The researchers demonstrated that their device can amplify a weak signal from an adjacent system even when that signal’s amplitude is as tiny as ten trillionths of a meter. That ability could mean huge improvements in detecting small oscillating signals, Roxworthy says.